Today, we’ll talk about price formations that can be traded quite easily. There is a whole bunch of them and even though they do not appear as frequent as supports and resistances, it’s good to know something about them, so we don’t get caught of guard. 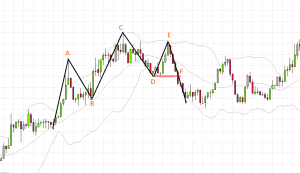 These formations appear on all asset types, such as commodities or forex. Formations that we’ll talk about are: double bottom, double top and head and shoulders. So, let’s get straight to it. This might possibly be the most famous formation that can be traded several times a day (using an M5 timeframe). The formation double top means that the price simply bounces twice (or more times) from one single resistance level. The general rule applies that the more bounces the price makes, the stronger the signal towards the trade and to a trend reversal. 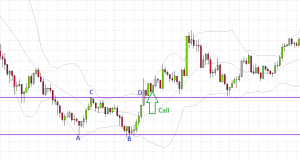 A PUT trade can be entered right when the bounce occurs. But that’s a different approach than what we will talk about now. The thing is that when the price reaches the peak and bounces off of the resistance, it brakes the former bottom and will then continue in its direction. When this formation occurs, it is likely that the trend will be reversed. Double bottom changes the bearish trend to bullish and double top, on the other hand, reverses a bullish trend. Another formation is called head and shoulder, but it’s not that common. It looks exactly as it is called. See figure No 2. The black line indicates the price. We are looking for a peak, then a little higher peak and if the next peak doesn’t reach the same price as the previous one and the price brakes the last bottom, we invest on the decrease of the price. Preview in figure No 3. Point E shows another bottom, a little higher than the previous one (our second shoulder). When the price, in point F, got under the level of the previous bottom (D) we invest on the decrease of the price – binary option put. This formation changed the trend as well, even though it’s not a rule. You can also find it the other way around – “upside down”. I hope that I’ve taught you something new today and that all your price formation trades will go according to the plan. If you have any questions, feel free to send them down in the comment section below. I read them daily!